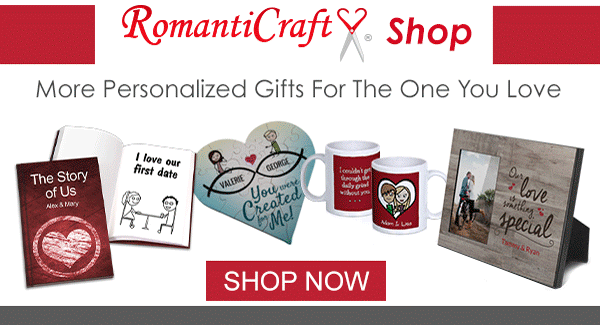 Add your own unique touch with romantic personalized gifts to make your sweetheart feel loved like no other. 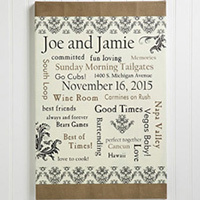 Create truly special sentimental gifts and personalize with phrases, names, poems and flowers. Your words will be preserved as a lasting and loving reminder. 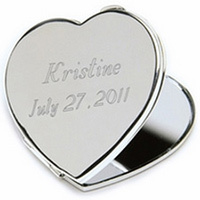 Romantic personalized gifts are one-of-a-kind cherished keepsakes that will be saved and read often through the years. 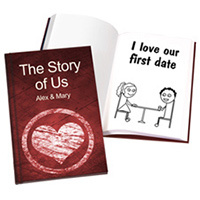 List all the reasons why you love someone in a custom bound gift book. 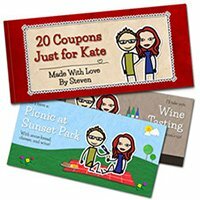 Easy to create pages using simple drag and drop stick figures, expressions, scenes, images, personalized text and an ideas database to get started. Write your own personalized love message and have it found by your loved one. Hide it in the house and make a treasure map with it's location for a surprise. Optional birch crate for mailing if there are miles that separate the two of you. Share your sentiment of love and trust with your partner. 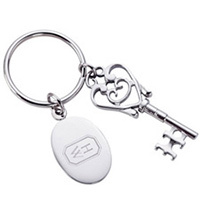 Engrave "You've unlocked my heart" on the keyring plate. Add this to your partner's keys to find as a surprise. Add your names, anniversary date, and 13 lines of text onto a canvas to highlight the most important moments you have shared together. 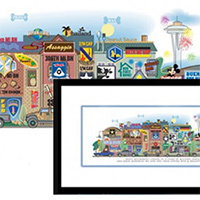 Gallery wrapped canvas with archival inks measures 12"x18" or choose a wood frame. Give a small token of your love with meaningful words to always carry close. 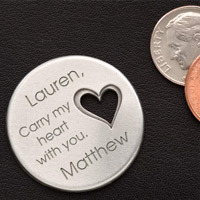 A pewter coin engraved with any name, three lines of text, and an ending sentiment next to the open heart cut out. Show her that love is really the best medicine. 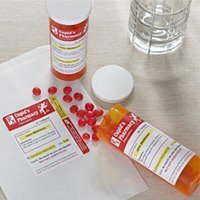 Dr. Feelgood from the Cupid Pharmacy prescribes kisses and hugs with a personalized name of your lovesick patient on the labels. 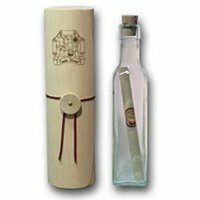 Make a unique scroll in your own words by choosing the colors of paper, finials, ribbon, tassle, and an optional wood box or velvet bag for the perfect presentation. 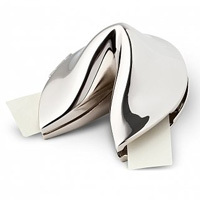 Write your own loving fortune inside a silver-plated fortune cookie. Includes a custom printed message up to 100 characters, black velvet pouch and gift box. Or try the gold-plated one (without extras). Choose 8 sentimental words that lovingly describe why you love your beloved on a heart-shaped cherry wood stained jewelry box. Your name on the top and her name on the bottom. 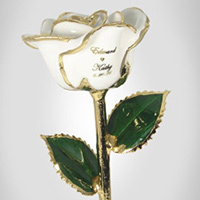 A real preserved rose trimmed in gold, platinum, or silver personalized with the couple's names and their special date on the petal. The 11 inch rose is available in assorted colors and an optional crystal vase. 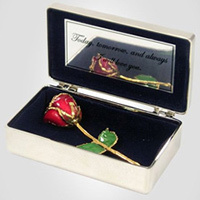 A real preserved 3 inch mini rose preserved in laquer and trimmed in 24k gold inside a silver cherish box with optional engraved plates on the inside or top. Available in assorted colors. 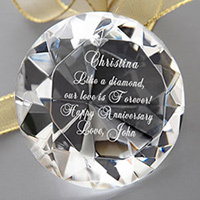 Laser engrave your names and choose from 3 puzzle themed messages of love. 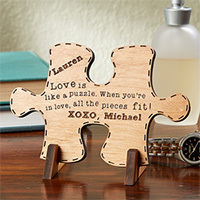 Made of 1/4" thick alder wood in the shape of a puzzle piece with included stand. Tell her how precious and rare she is with a sparkling and intricately cut crystal in the shape of a diamond. 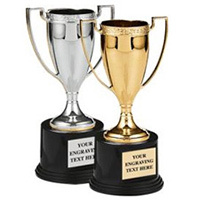 Engrave three lines of text with a name and closing sentiment. Measures 3 inches in diameter and includes gift box. 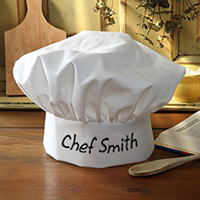 Customize the chef hat with any name or title to show how much you appreciate your loved one's cooking. If you are not the one who usually cooks, then make a special dinner wearing this. Poly/cotton fabric with velcro closure. 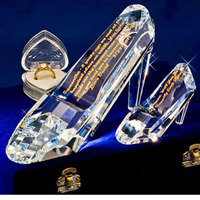 Your love is a fairy tale come true with a crystal clear glass slipper and a romantic inscription of heartfelt words in optional gold filled lettering. 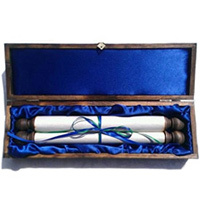 Available in 4 inch or 8 inch sizes and includes an elegant blue velvet box. Capture cherished memories and moments with a stroll down your memory lane. A unique art print themed by your submitted information such as favorite places, first date location, anniversary, vacations, children, vehicles, etc. 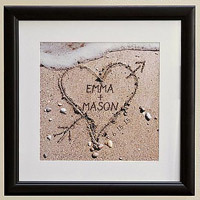 Your first names are laser engraved onto a 4"x6" wood frame to showcase a loving couple photo. Choose from 5 verse options or make your own custom message. 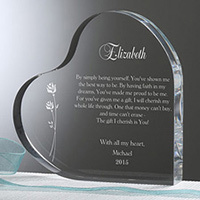 Display a special custom loving message (or choose from two verses) reverse-engraved which creates a transparent mirage on shimmering lucite. Tell someone how much of a difference s/he makes. 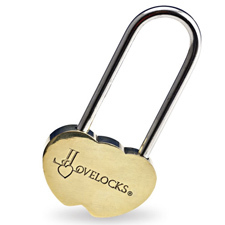 A double heart shaped padlock that permanently locks once is a unique symbol of an everlasting love and committed relationship. Solid brass with optional engraving on the back. 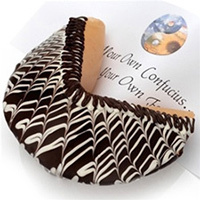 A huge cookie about the size of a small football with a personalized 12 inch long romantic fortune for your loved one to find inside. Send it to her work address so her co-workers can help her eat it. 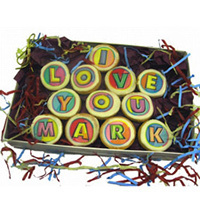 "Say It In Cookies Box"
Spell out your feelings plainly in a sweet way with one letter per cookie and up to 24 cookies. Each cookie is about 1 inch in size. 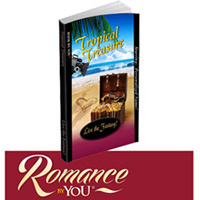 Customize over 30 characteristics like names, features, and places to co-author your own romance novel. Upload a cover photo and include a dedication. Available in paperback, hardcover, and e-book. Two lines of free engraving. On the first line "In my heart", followed by the second line "is only...." or you can personalize it your own way. 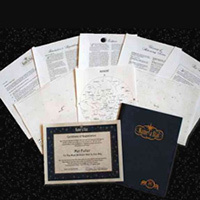 The Original Star Naming Service - Since 1978® Personalized with her/his name and a tribute below name on the registration certificate to say anything you want like "You are my shining star." Also includes the date given and your name. 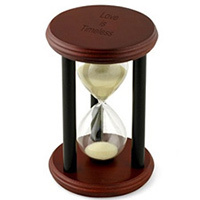 Give your loved one something that is so precious to both of you - time. The top can be personalized with her/his name - "Our love is" on the first line and "Timeless -" with your name on the second line. Forever inscribe your true feelings for the love of your life on a glistening lucite heart sculpture to be read often through the years. 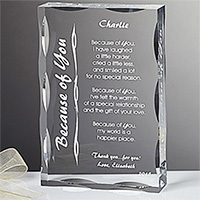 Give your sweetheart an award with an engraved plate for 3 lines of text. On the first line use bold capitals for: BEST COOK, BEST WIFE, etc. and a loving note on the other 2 lines. Fill with favorite treats. 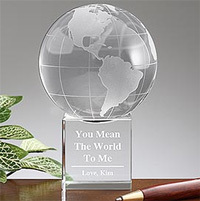 Glass globe with engraving reads "You Mean The World To Me" with your name. Two individual pieces- globe and stand- so that it turns. Satin lined gift box included. 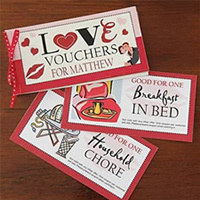 If you have your best conversations over a coffee or tea in the morning or at night, then these are very meaningful. 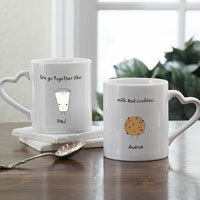 Choose from milk and cookies, burgers and fries, peanut butter and jelly, other great together foods. Be as artistic and loving as you want with chocolate and her/him as your canvas. Message on top of the paint lid. 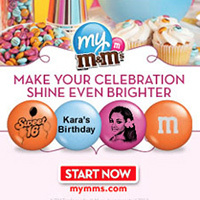 Add your own words, phrases, romantic message or photo to M&M′s® candies. Tell or show how sweet s/he is or "I melt in your hands." Both of your names printed on the front of the cuddly teddy bear's shirt. 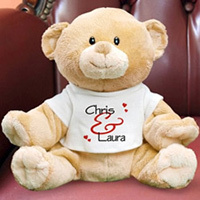 Use the bear to present a small gift. Bear measures 8 inches tall. 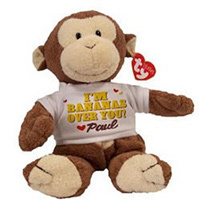 Both of your names printed on the front of the soft teddy bear's shirt. Use the bear to present a small gift. Bear measures 8 inches tall. Your names are "drawn" within the heart in the sand. Bring back memories of a romantic walk along the beach together. Includes 16" black wood frame. 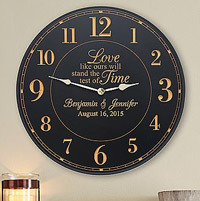 Laser engrave your unique message like "Love like ours will stand the test of time" onto a simple black clock face as well as your names and anniversary date. Nickel plated safe with real combination lock and handle. 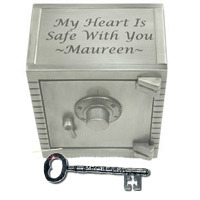 Inside the safe is a pewter key with "My Heart" etched on it in a red velvet bag. Engrave "My heart is safe with you" on top. 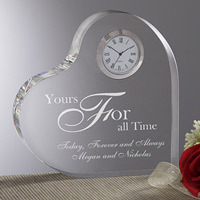 Tell your beloved that you cherish every minute through a glass heart with silver clock etched with "Yours For All Time" or "Our Love is Timeless." Includes a personal ending sentiment and your names. 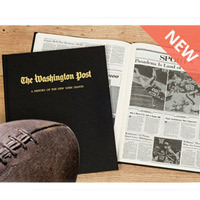 Choose your sport fan's favorite football or baseball team from 12 NFL teams and 10 MLB teams for a 60-100 page history in news articles. Customized with a message page and debossed with "Presented to _" on the cover. 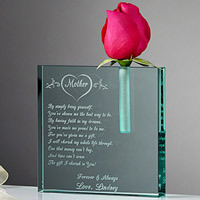 Write your own message or choose one of three pre-written verses laser engraved on thick glass with a small bud vase attached to add a single rose or flower. 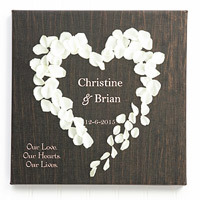 Real rose petals hand-formed into the shape of a heart on a canvas personalized with your names in the center and optional date. The large version has 3 lines of text on the side or choose from 3 romantic verses.